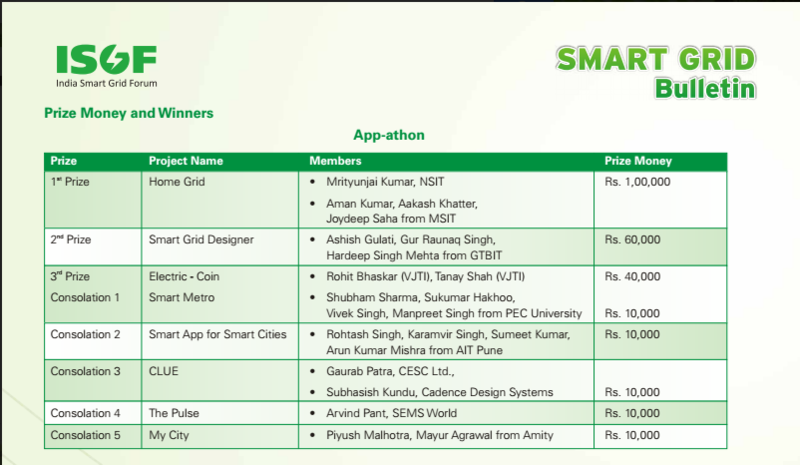 We won the App-athon 2016 organized by ISGF(India Smart Grid Forum). We designed a real-time, two-way data binded Android app with https://iot.net.in as D2S master server, hosted on AWS. This server was getting data from embedded hardware with latency period of 600ms (under ideal condition with 2G Bandwidth) . It was an extended and advance version of hardware side of the project that i presented at ELECRAMA in Feb, 2016. It basically extended the user interface with the help GCM(Google Cloud Messaging), server side data analytics, Graphical data representation, two-way data binded embedded device control for units, GEO-fencing and much more. As data was available on server in real-time, there was an interface, to aggregated data for power needed to be fed in supply line for Grid Management, This independent system was on RasPi based system with LCD. There is much more in this over-all system to describe like power-signature etc., its just an over-view of what my team achieved in this event organised by ISGF(India Smart Grid Forum). And yes, It was a team effort from both hardware as well as Software team. Below is a snapshot of ISGF’s magazine. Next Post Debugging Android app wirelessly (over wifi).